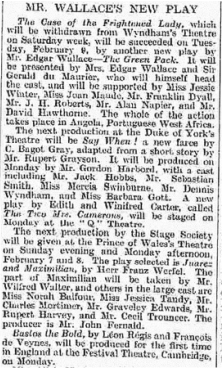 Charles Mortimer appeared in "Juarez and Maximillian", playing Bazaine, at the Prince of Wales Theatre, London, on 7/8 February, 1932. In the cast was Jessica Tandy, who became a famous Hollywood actress (Driving Miss Daisy) and who won 4 Tony Awards, and a lifetime achievevment Tony in 1994. She was also married to Jack Hawkins for 8 years. With kind permission of the Times, 28 January, 1932.